In case the video is not playing, watch it on YouTube. Longevity – one of humankind’s all-time goals and desires – turns out to be boon and bane. 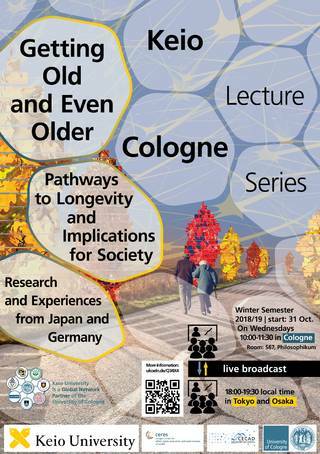 Japan and Germany are among the countries, where not only individuals tend to get old and older, but the entire society is aging and has to adapt to a substantial demographic change. With a life expectancy of 85 years in Japan and 81 years in Germany and an almost identical average age of 47.2 years of populations in both countries, Japan and Germany share common problems and challenges. Individual longevity implies an increase of aging-associated diseases, a growing need for age-appropriated environments and living conditions, higher demand of elder care, public health care and pension funds under stress, financial pressure on taxpayers, strain on the labor market and many more issues to be dealt with from medical, political, social, economic and legal points of view. Today, Keio University is playing a leading role in the academic world, attracting highly talented students and researchers from home and abroad. 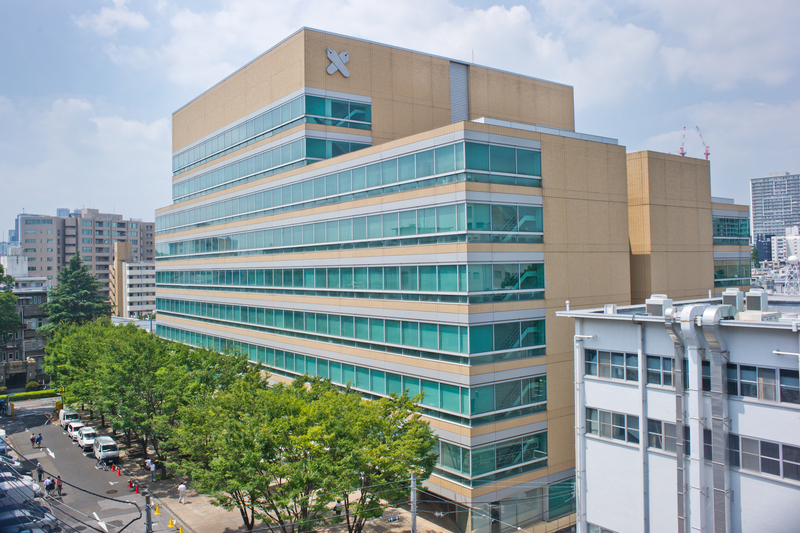 Looking ahead, it endeavors to make further contributions to society, strengthen its international reputation, and solidify its position as a world-leading research university (source: https://www.keio.ac.jp/en/about/). Follow one international student's breathtaking journey through the heart of Tokyo and experience the sights and sounds of Keio University. CECAD provides an extremely dynamic environment for research into aging and aging-associated diseases. The image film shows a brief overview of the Cluster´s groundbreaking vision and offers insights into its state-of-the-art research. 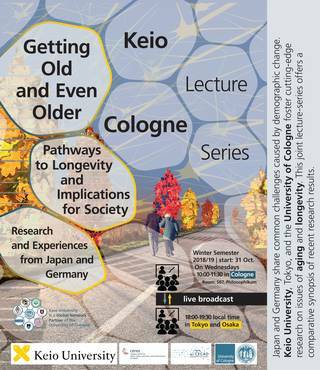 This lecutre series is an expansion of the Keio-Cologne collaboration in this field of research. Early in 2018 CECAD and Keio University already held a symposium on aging and longevity. Colin McKenzie is currently a professor in the Faculty of Economics at Keio University .Professor McKenzie graduated from the Faculty of Economics at the Australian National University in 1980 and obtained a Ph.D. in economics and econometrics from the Australian National University in 1986. 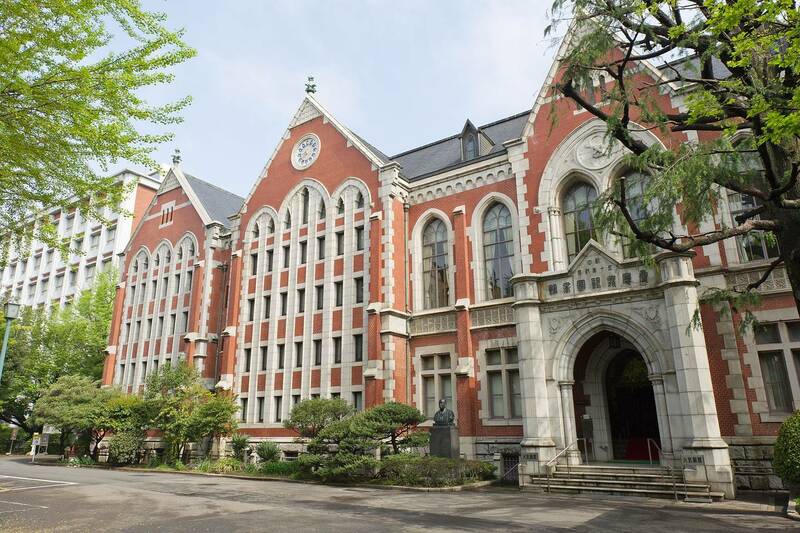 Before coming to Keio, he taught at the Faculty of Economics and Osaka School of International Public Policy, both at Osaka University. He specializes in applied economics. Luise Geithner, M.A., studied Sociology and Economics at the University of Jena (B.A.) and Socioeconomics at the University of Hamburg. After her graduation she was working as a research associate at the University of Applied Sciences Ludwigshafen in a project about outpatient care in rural areas of Germany and as associate lecturer at the University of Heidelberg. Since 2016 Luise Geithner is research associate in the project NRW80+ at ceres. Her research interests are in the field of social inequality, sociology of aging and quality of life. She currently works on her PhD project about the diversity of lifestyles in very old age. Yoko Ibuka is an associate professor of economics at Keio University, Tokyo, Japan. She is interested in a broad range of topics in health economics, focusing on understanding health-related behavior and exploring effective and/or efficient public health policies. Her expertise includes conducting empirical analyses on individual and group decision making on interventions against infectious diseases and the evaluation of public health policies. Her recent research also extends to the estimation of health expenditures in Japan using administrative data to shed light on the micro-level structure of healthcare costs. She obtained a BA and an MA in Economics from Keio University, and a PhD in Economics from Rutgers, the State University of New Jersey. Prior to joining Keio, she held the following positions: as postdoctoral researcher at the Yale School of Public Health, assistant professor at Hitotsubashi University, and associate professor at Kyoto and Tohoku Universities. Bjoern Schmitz-Luhn, b. 1978, studied Law in Cologne and Phoenix, USA, from 1998 to 2002. He then served as a court trainee at the Cologne Court of Appeals, and took positions abroad at the Department of Public Safety in Fairbanks, Alaska, and the German Embassy in Washington, D.C. He has been admitted to the Bar since 2006. From 2002, he has been working as a Research Associate and Fellow, and later as an Academic Councilor, at the Institute for Medical Law at the University of Cologne. There, he participated in various interdisciplinary research projects on medical law, including the German Science Foundation’s research group on prioritization in medicine. In 2014, he was made a doctor of legal science on the grounds of his monography on equity in health care, which was also awarded the A. Laufs prize for dissertations. His publications include legal and particularly interdisciplinary treatises on current topics of medical law and health care. He is an adjunct professor for medical law at the University for Economics and Management (FOM) in Essen, Germany. Since 2015, he has been the General Manager of ceres, heading the office and coordinating the operative research activities of the center. Christiane Jannes completed her bachelor's degree in Health Economics at the University of Cologne and her master's degree in Medical Management at the University of Duisburg-Essen. From 2011 to 2016 she worked as a student/research assistant at ceres. Since June 2016, she has been a research associate and is, inter alia, investigator of projects focusing on digitization in health care and health services research. Her research interests include digitization in healthcare, the care of premature infants and the International Classification of Functioning, Disability and Health (ICF). Dr. Roman Kaspar is a Postdoc at the Cologne Center for Ethics, Rights, Economics, and Social Sciences of Health (ceres) at the University of Cologne and the coordinator of the working group on Quality of Life and Subjective Well-Being of the Very Old. He earned his PhD in Psychology at the Institute of Gerontology at the University of Heidelberg. He has a strong background in environmental aging research and a profound interest in quantitative research methods. His contributions include assessment approaches to quality of life in dementia, competence assessment in geriatric care, subjective aging and perceptions of home and neighborhood. Dr. Atsuhiro Yamada is a labour economist and is currently Professor of Social Policy at Keio University (Tokyo, Japan). Formerly he worked for National Institute of Population and Social Security Research, and Organization for Economic Cooperation and Development as an economist. He is one of the authors of The Economics of Older Workers in Japan (Tokyo: Nihon Keizai Shinbun-sha, 2004). He has written on the effect of various Japan’s public policies related to the older workers and on the income distribution of older people. He is also a member of the Social Security Council in Japan. Anna Janhsen studied Catholic Theology, Philosophy / Applied Philosophy, British and American Studies and Pedagogy in Münster and finished her studies in 2013 with the degrees Master of Education (1st state examination for teaching in secondary schools) as well as Master of Arts (Major: Medical Ethics). After two years working as a research associate at the University of Münster and additional teaching assignments at the Luther College Decorah, Iowa (USA), and the University of Kassel, she joins the project NRW80+ at ceres as a research associate in 2015. Her research interests are in the fields of medical and applied ethics, phenomenology, medical, philosophical and theological anthropology and sociology of the body. In addition, she currently works on her PhD project on the role and function of spirituality for well-being of the oldest old as part of the Interdisciplinary Program Health Sciences (IPHS) at the University of Cologne. 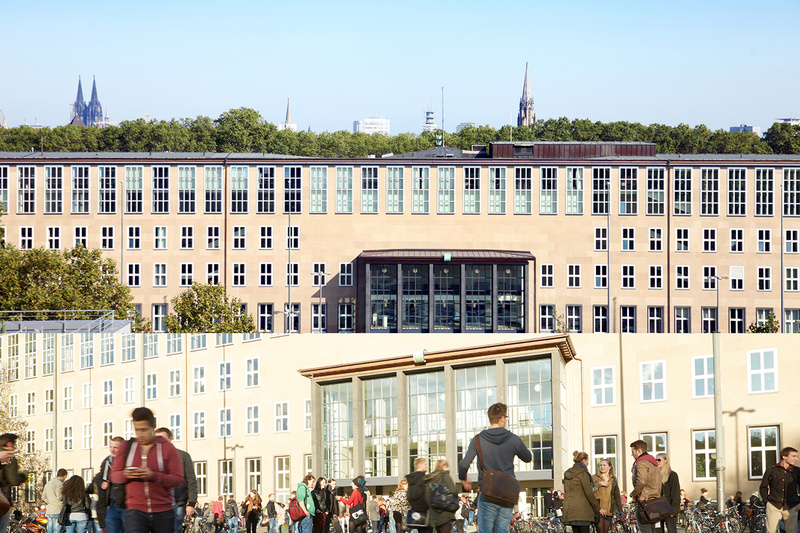 The highest level of cooperation offered by the University of Cologne to other international Universities is the „Global Network Partnership“.